Did you hear about the farmer who lived next door to a pessimist? If the farmer said “Isn’t is a beautiful sunny day?” the pessimist would reply, “We need rain.” If it rained and the farmer commented on how wonderful it was to have rain, the pessimist would reply, “It’ll probably ruin the crops.” He always managed to see the worst in any situation. But one day the farmer decided he would put an end to his neighbor’s pessimism. He called his neighbor to come over and see an amazing trick his dog could do. The farmer proceeded to throw a stick into the middle of his pond. Immediately the dog jumped on top of the water out to the floating stick. 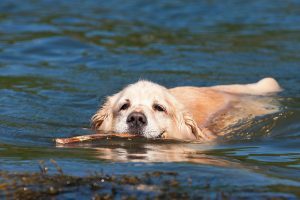 He carefully picked it up in his mouth, walked back across on top of the water safely to the shore and laid the stick at the pessimist’s feet. In the Gospel of Matthew, we read the description of Jesus walking on the water toward His disciples in their boat. If you had witnessed this, what would you have done? Would you have been skeptical? Afraid? Like Peter and ask Jesus to walk on water too? Now remember this was no calm lake on a bright sunny day that Peter stepped onto. It was the middle of the night, a strong wind was whipping,and the boat was fighting heavy waves. It took some amazing courage on Peter’s part to step over the side of that boat. and it paid off as he, just like the farmer’s dog 🙂 walked on top of the water. But Peter’s triumph quickly turned to trouble as he became terrified and started sinking. Did Peter sink because the wind got stronger or the waves got higher? I don’t think so. I think it was because he took his eyes off Jesus and looked at his circumstances instead.